Beef has a bad reputation, but it can be good for you. It's a great source of protein, iron, and heart healthy B vitamins. Choose from lean cuts of meat to make your meal a healthy one. Try this fast & tasty beef dinner, with only 262 calories per serving, that can be made in 20 minutes or less. 2. Arrange bread pieces and almonds on a baking sheet in a single layer. Broil until lightly browned, about 1 minute. 3. Add the toasted bread and almonds to a food processor and process until coarsley ground. 4. Heat olive oil, chopped garlic and paprika on medium heat in a small skillet. Cook for 1 minute or just until the garlic begins to brown. 5. Add the oil/garlic mixture, sherry vinegar, bell peppers, and 1/8 teaspoon salt to the bread mixture in the food processor and process until smooth. 6. 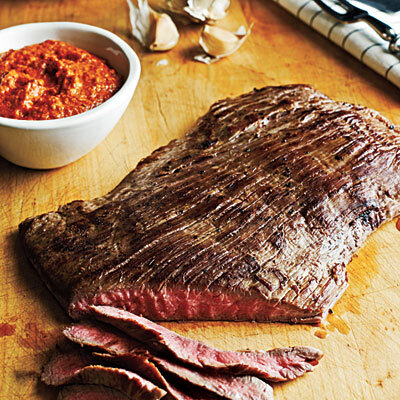 Sprinkle the remaining salt evenly over the flank steak and season steak with the black pepper. 7. Coat a broiler pan with cooking spray. Place steak on the broiler pan, broil 5 minutes on each side or until desired degree of doneness is reached. 8. Let steak stand for at least 5 minutes before slicing to allow the juices to settle. Cut steak diagonally across the grain into thin slices. Serve with sauce. This entry was posted in Weight Loss Recipes and tagged Beef recipes, weight loss recipe, Weight Loss Recipes by Jamie Eberle. Bookmark the permalink.